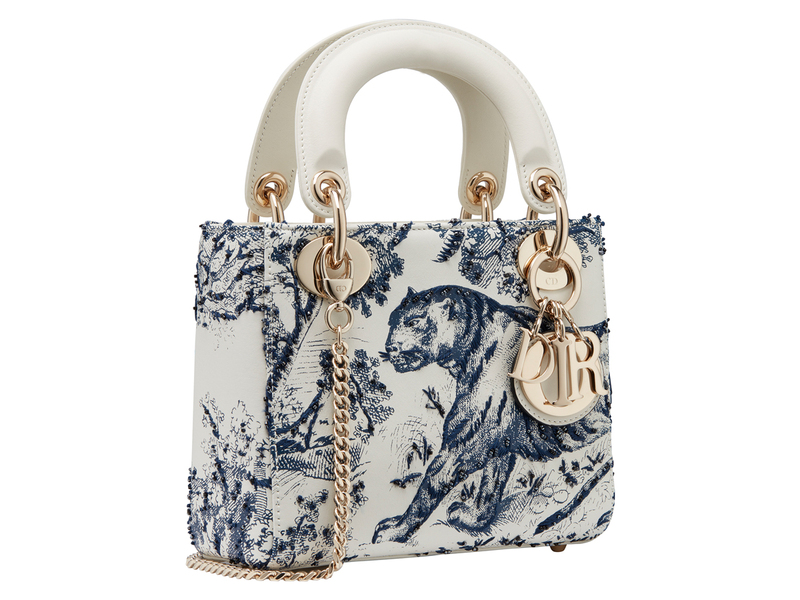 Dior’s Toile de Jouy pattern first appeared in the walls of the French luxury brand’s flagship store back in 1947, an intricate pattern decorated with pastoral landscapes that soon became an icon in its very own right. Over time, the same intricate pattern appeared on shoes created by Roger Vivier during his tenure with Christian Dior. More recently, it was revisited by the likes of Dior’s Kim Jones for his Spring-Summer 2019 show and is also the one of the focus prints of Maria Grazia Chiuri’s current Cruise 2019 collection. Ms Chiuri has given the pattern her very own update, with the inclusion of several wild animals like bears, giraffes and tigers that were hand drawn into the pastoral scenes. Feature colours include traditional dyes of blue, green and red, two of which (Blue and Burgundy) are used in the gorgeous silkscreen print of the Mini Lady Dior bag. In a white calfskin body that measures 17 cm by 15 cm, it is decorated with gold-tone metallic hardware elements for that luxurious touch. The additional chain strap is detachable, allowing you to carry it across the body, or daintily as a handbag via its top handles. Priced at SGD6300 for the Mini Lady Dior that’s now available in boutiques, you could also go up one size and get the bigger one that will retail for SGD7800. Just make sure you do because this print is definitely going to be a classic in its own right in due time.